Proper roofing shoes are one of the most important investments you can make if you are going to be doing any sort of roofing work. Whether you are a lifelong roofer, or just looking to tackle a job on your own for your home, having the right roofing shoes is key to your safety. You’re surely going to take every safety precaution with your tools such as your roofing hatchet or shovel to ensure you aren’t injured on the job, why would you treat your boots any differently?. 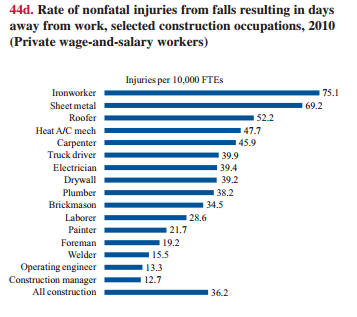 While not typically thought of as one of the most important tools for the job, roofing shoes are definitely one of the biggest factors to truly having a safe working environment. 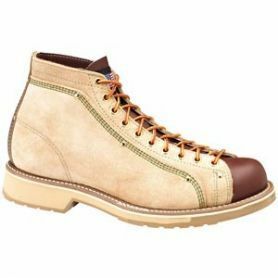 Our only recommended pair of roofing shoes are the classic Thorogood Roofer’s Shoes. These roofing shoes are tailored specifically for your roofing needs. The hard gripping and slip-resistant polyurethane soles of these roofing shoes ensure that you will always have firm footing, even in the most precarious of positions! While the insoles in these roofing shoes help to make sure you’re comfortable even during the toughest of your jobs. Nothing destroys a good pair of work boots as fast as abrasion and friction. However, the Thorogood roofing shoes take precautions against this, making for a long lasting American made product that will keep you comfortable and safe for years to comes. The smooth brown leather of these roofing shoes are surrounded by a sturdy tan roughout, acting as a guard to ensure your roofing shoes last! While the roughout takes the scrapes and abrasions, the interior leather remains undamaged and keeps you as comfortable and safe as the day you bought them. Some people may say roofing shoes aren’t important - don’t fall for it! 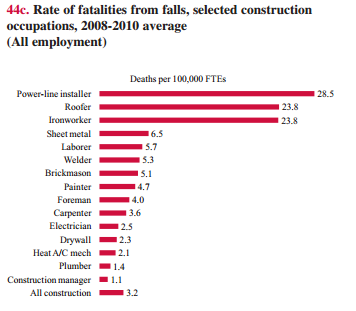 While it is true that proper roofing shoes aren’t guaranteed to prevent you from falling 100% of the time, they do make a significant difference in terms of your overall safety on the job. 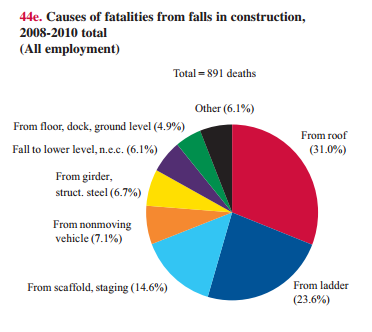 With such a large portion of the fatalities and injuries in this industry occurring from falls, why would you not take every precaution you can to keep yourself safe? Get your own quality pair of roofing shoes today! If you’re looking to do any kind of roofing work, or just work in general where a shoe with good grip is important, be sure to look into getting your own pair of roofing shoes before you do it! We offer our favorite Thorogood Roofing Shoes right here at AJC Tools so check them out today! Be sure to come back and leave a comment after you get your pair and let us know what you think!